Private ancillary funds are becoming an increasingly important source of financial support for Not for Profit organisations, writes Jeff Buchanan, Senior Fundraising Consultant at AskRIGHT. In this analysis he looks at compelling figures released by the ATO (2013/2014) about Private ancillary funds. Private ancillary funds (PAFs) are gifting vehicles established by wealthy individuals and some businesses. They are becoming an increasingly important source of financial support that Not for Profit organisations cannot ignore. Indeed, although they are lag indicators, the figures released by the ATO are rapidly becoming too big not to be noticed. At the end of the 2014 financial year, the net amount of assets held in private ancillary funds had risen to an enormous $3.966 billion. This was a rise of more than $1.15 billion or 40 per cent on the previous year. What an incredible surge! While that one year rise alone is a remarkable thing, it is even more extraordinary to consider that Paul Ramsay’s PAF, which is worth approximately $3 billion, has not even come into calculations just yet. 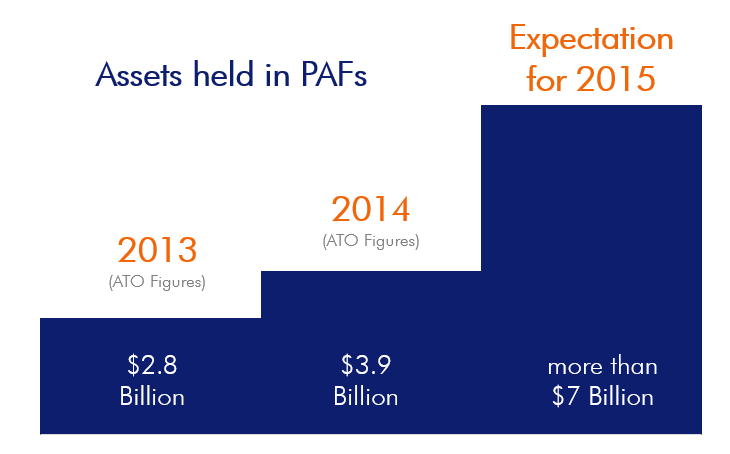 So when the next set of figures are released, the net asset value of PAFs is expected to rise to well over $7 billion. And $8 billion is not out of the question. 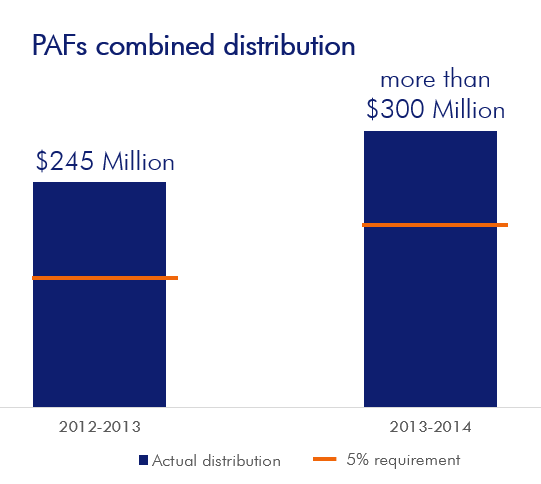 During the 2013/2014 financial year, all PAFs combined distributed more than $300 million. This distribution was a $56 million increase on the previous year, or a 23 per cent increase. Those who follow PAFS will know that there is a legislated obligation to distribute 5 per cent of the net asset value or $11,000 each year, whichever is the greater. It is encouraging that each year, PAFs are punching above their minimum requirement and exceeding the 5 per cent minimum. The distribution of more than $300 million from a net asset base of $3.966 billion represents a 7.6 per cent distribution – more than 50 per cent above the minimum requirement. Take a bow PAF founders and directors. This is the total amount of funds that PAFs have distributed in total across all years from 2001/2014. Even though one can rightly speculate that wealthy individuals would still have given generously as individuals in the same time frame without the advent of PAFs, any reasonable analysis can only conclude that the PAF system is working well and heading in the right direction. The directors of the Paul Ramsay Foundation are already underway, with the foundation being reported on making some multi-million dollar commitments. On any reasonable assessment of their asset base, they will be obligated to distribute more than $150 million each year. That’s $3 million per week on average. First, you will need to check if your organisation is eligible to apply for funding from PAFs. Then, you will need to do some prospect research. Researching private ancillary funds is in most cases similar to identifying and contacting new major gift prospects. PAFs are not to be treated like a grant application. It is important to select the relevant PAFs and build a relationship with them: mailing unsolicited material to all or most PAFs is both ineffective and inappropriate. Identify PAFs you feel are good prospects. Research the PAF – identify the link. Design a strategy for cultivating the relationship. Build or cultivate the relationship with the PAF holders. Ask the PAF holder(s) for a gift. Account for how the gift is used and the difference it made. The Complete Guide to Australia’s Private Ancillary Funds™ is a unique online database compiling information from both public and pay-for-content sources on all of Australia’s private ancillary funds. It helps with the first three steps of the seven step process. the scope of information varies according to fund. Determine which PAFs are most likely to support their organisation. Establish priorities and where to invest time. Ascertain the best approach for asking. Identify potential links with PAF directors. Ascertain how much to ask for. There are currently 1,499 PAFs listed in the PAF guide. Fundraisers can browse the entries by name of fund, sector funded, geographic area funded, registration postcode and keywords. Nearly 100 organisations use it to raise more money for their cause. Considering that each PAF is required to have a minimum of three directors, it means there are approximately 4,500 PAF directors. These individuals are usually active in some way in the Not for Profit sectors. So Not for Profit organisations probably have some of them in their database, listed as a donor, a board member or a volunteer. AskRIGHT can scan your database to identify PAF directors. Contact admin@AskRIGHT.com or call 1300 758 812 for further information. The 90-minute webinar, How to Raise Money from PAFs, will give you the key information you need to better understand private ancillary funds, their characteristics and diversity. This training also includes tips on the best way to approach them for support. Click here to register and use the coupon code ProBonoAustraliaPAF at the time of purchase to get 50 per cent off your registration (coupon valid until 6 June 2016).